Boston has so much to do it is hard to fit it all in. 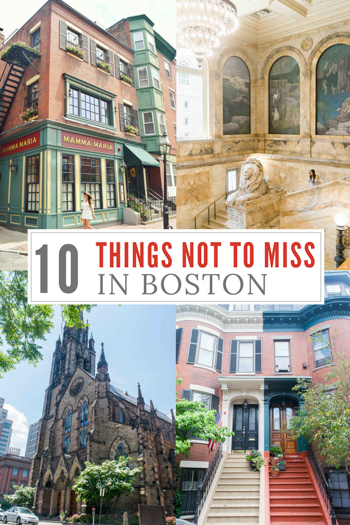 Here are 10 things you shouldn't miss the next time you go to Boston. Even if you aren't seeing a game Fenway park is an awesome experience! Walk around the historic area and have a beer at the Bleacher Bar before the game starts. The bar has a perfect view of the field! Located right next to each other you may walk both and think they are the same! Both are beautiful in their own right with lots of history. The Westin Copley Place (one of my favorite hotels in Boston) is also right across the street from the Public library - talk about a good location. I highly recommend staying there - you can read my full review of my stay here and why it's my favorite hotel in Boston here. The inside of the famous Faneuil Hall will make you think you are in the 1700's and standing among founding fathers. Right across is the marketplace - a perfect stop to try a lobster roll. Probably the most popular thing to do in Boston - and for good reason. The freedom trail is a perfect walk to take in all of the famous sights in Boston while learning about US History. Technically on the freedom trail, the granary burial grounds hold the resting place of many of our founding fathers. Franklin's parents grave is in the center and cannot be missed. Nicknamed the most beautiful street in America this tiny little lane is perfect for a mid-afternoon stroll. Gorgeous houses line the never ending streets. Perfect picture opportunites! Sunsets are best spent on a rooftop with a drink in hand. I recommend the XV Beacon rooftop. You can read my full review of the hotel here. DO NOT MISS MIKE'S PASTRY!!! Expect a line and the BEST cannoli's you have ever tasted. Also, while in the north end, make a reservation for dinner at one of the many classic Italian restaurants.